The Fellowship was fortunate enough to obtain a copy of DEMONIC #1 from Image Comics and Skybound Entertainment. Christopher Sebela writes, Niko Walter draws, Dan Brown colors, and Sal Cipriano letters. Scott is a good cop, always careful. He’s got a good partner, a good wife, and a beautiful little girl who’s got some medical problems. But he also has some weirdness in his past, and he gets a strong reminder on a domestic disturbance call. Then his daughter gets sick again, and that’s when things get scary. He gets approached by something like a demon, who also remembers his past, and who offers to save his little girl if he will be her weapon. There’s a lot of story packed into these pages, but there’s so much left untold. And that is how you build a great first issue. Serial killer stories are pretty popular right now, but this one is different – it’s told from the killer’s point of view. And he’s a likeable guy, which makes it all the more chilling. And the art is just beautiful, with all of the detail of a jumper hitting the sidewalk paired with the creepy blur of a vicious massacre shown from the inside of Scott’s mind. This is worth checking out just as a serial killer story, but adding the supernatural element pushes into “must read” territory. Seriously, go get this book. 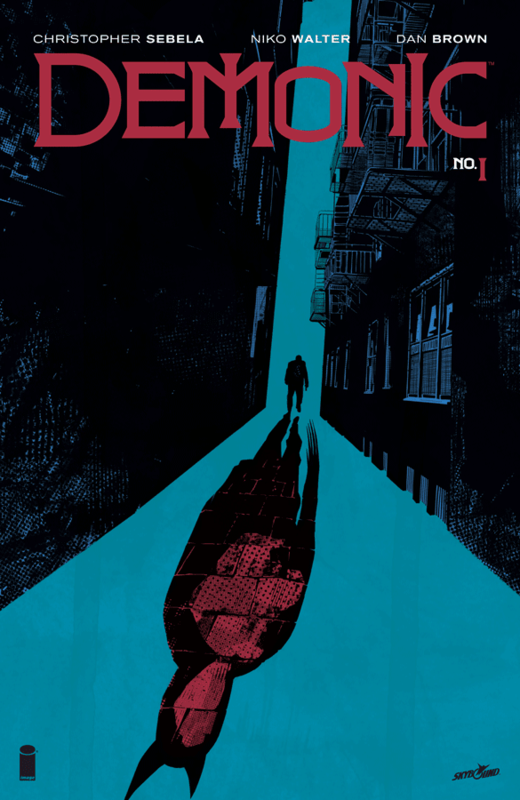 DEMONIC #1 is available now at your FLCS or at imagecomics.com.